I am a bit stuck with this photograph. It was recently supplied to me by Martyn Lawrence but I have no idea of the location or occasion. There are several people I can put names to and many I can't. OK here we go with some names. Mary George, Diana Warland, Dorothy Barnett, Mary Trussler, ?, Edna Breeds, (the lady from Neals), ?. The children at the front are Amanda Warland, Janet Warland, John Barnett, Rosemary Barnett, ?, Penny Barnett, Cecilia George, Brenda Warland. 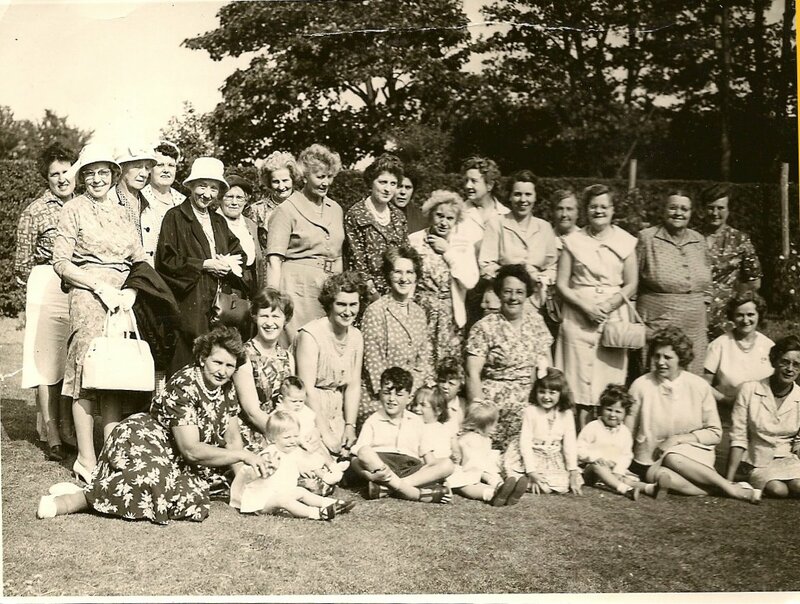 Mrs Barber (Akela in the Cubs), Mrs Baitup, Mrs Weeks, ?, Jessie Foster, ?, ?, Win Garratt half hidden in the middle, Mrs Levett, Mrs Cottam (rev Cottam's wife), ?, ?, ?, ?, ?, ?, Sister Diemooz.